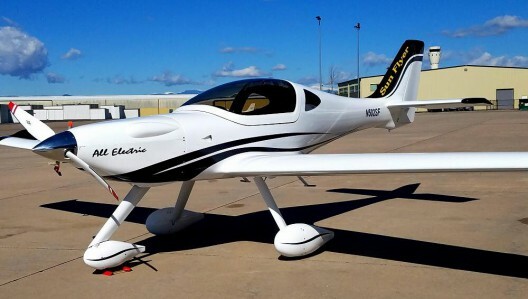 Yesterday, George Bye’s Aero Electric Aircraft Company (AEAC) rolled out its Sun Flyer, an electric two-seat training aircraft with photo-voltaic cells on the wing and tail to extend its range, and over two or three days, recharge its batteries. With orders for 65 Sun Flyers already on the books, interest is high in this airplane. Looking a great deal like a fixed-gear Lancair, Sun Flyer will offer extremely low operating costs, a real draw for prospective pilots. Bye estimates operational costs, including charging and maintenance, will run about $11 an hour. Operational costs for a typical Cessna 172 trainer are about $66 an hour, making aircraft like the Sun Flyer a potential gateway into flying for new or lapsed pilots. The airplane’s LG Chem 300-pound lithium-ion batteries have an energy density of 260 Watts per kilogram, enough to keep the Sun Flyer airborne for three hours, according to Bye. Solar cells can provide two kilowatts continuously, and can extend range and endurance. To enable quicker recharging, Sun Flyer is partnered with The Bloomington Corp. of Orlando, Florida, now working on a national network of battery charging stations. They’ve also bought 30 Sun Flyers, along with 35 others by Spartan College of Aeronautics and Technology and a local flight school. This Proof of Concept (POC) machine will begin flight tests in the second quarter of 2016, and is anticipated to show up at AirVenture 2016, possibly even flying in. A modern trainer that redefines the economics of flying may be just what the market needs to resurrect a flagging industry. Sun Flyer and others coming will need to meet FAA Part 23 regulations to reach that market – and that may be a bigger challenge than any engineering or logistics obstacle. George has been working with the FAA on establishing a path forward. For many reasons, we hope his efforts are successful. 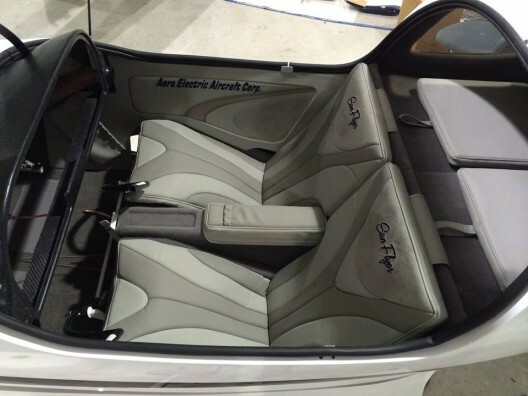 AEACAero Electric Aircraft Corporation (AEAC)Enstroj Emrax 268 high voltage electric motorGeorge ByeLG Chem batteriessolar aircraftSpartan College of Aeronautics and TechnologySun FlyerThe Bloomington Corp.